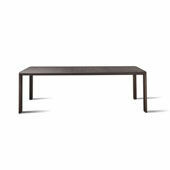 Belgravia is large dining table with a rectangular top in marble and a solid wooden frame. Like its name might suggest, it takes after Belgravia, one of the most exclusive London neighbourhoods. Part of a table series with fluid silhouettes, each piece has a structural frame in reinforced glulam available in grey oak and eucalyptus. The tops are available in several sizes and in a choice of: different types of wood (grey oak, graphite oak and eucalyptus) with diagonal grain, marble in a glossy polyester finish ("grigio oriente" and "emperador dark") as well as back-painted glass.